Reducing handling storage and transportation of Bobbins / Pirns. Elimination of the dangerous hand � knife process. Special builder cam lever attachment is provided for getting require shape of cones. Slow �falling attachment to avoid damage to drums by reducing the impact of spindles on drums. Automatic mechanical stop motion to ensure trouble free performance. 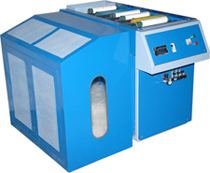 Machine will self strip the bobbin as such no cutting is required like conventional machine, No scratches or cut on the bobbin, longer life of Bobbins. Machine will completely open the fibre so that the same can be directly feed in the mixing. Quick stripping and opening, Reducing in stock of the Bobbin. The evacuated rovings are thoroughly opened by applying compressed air current as a medium. 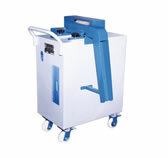 This ensures that there is no physical damage to the fibre and bobbin as well. 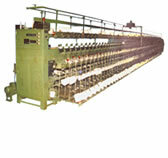 The roving can be effectively used as fresh raw material without affecting yarn quality. The operation is more scientific and requires less labour. Fully contained unit with stripping of the roving bobbins and opening of the fibre. 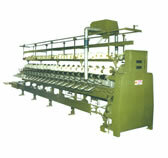 Variable unwinding speed to suit various material and twist parameters. Simple operation and occupies less space. Individual motor of each drum.